Aled Llewellyn-Jones and Ben Willett soon the 29er class. West Wales sailors took advantage of home waters to produce a series of strong performances in the BYS Welsh Regional Championships at Pembrokeshire Yacht Club. The youth and junior event in the waters off Milford Haven was also the first of the new look RYA regional championships, with around 1,000 competitors taking part in eight venues around the UK – more than 100 of them in Wales. Tenby pair Oscar Thompson and Iolo Shaw held off Llandudno’s Freddie MacClaverty and Kiera Luke in the RS Feva, while Saundersfoot and Llangorse pair Aled Llewellyn-Jones and Ben Willett won the 29er class, with Lou Boorman and Miles Everett of Dale and Llangorse in second. Tenby’s Oscar Thompson and Iolo Shaw won the RS Feva class. Finn Robarts of Fishguard Bay won the Laser Radial, with Dale’s Jake Scott second and Pembrokeshire’s Ioan Davies in third. Shotwick Lake’s Kieran Lewis held off Pembrokeshire’s Robbie Smart in the Laser 4.7. Fishguard Bay’s Finn Roberts triumphed in the Laser Radial. In the OnBoard fleets there were wins for Pembrokeshire’s Liam Evans, Optimist, Rowan Joseph of Pembrokeshire Performance Sailing Academy, Optibat, Neyland’s Sean Reynolds, Topper, PPSA’s Sirene Le Petit, RS Tera Sport, and Pembrokeshire’s Gareth MacLachlan in the Laser Pico. There were other All Afloat sailors who started sailing this year in the regatta fleet, Keira Edwards and Liam Reynolds, Pico , Neyland, Sean Reynolds, Topper, Neyland , Obaidullah Khorsand, Topper, Mumbles, and Gareth Machlachlan, Pico, Pmbrokeshire. Wales squad sailor Tasmyn Green tamed the boys to win the Optimist title. while fellow North Wales and Wales squad sailor Callum Davidson Guild, a former winner in the Optimist class of boat, claimed the 420 title along with crew Oscar Cawthorne, as well as second in the General Handicap class. There was also a notable performance by Mumbles sailor Harry Pressdee who came through the OnBoard programme to encourage new people into sailing to claim third place in the Topper class of boat, including winning his final two races. Children aged between six and 18 travelled from far and wide to eight venues across the UK for two days of fun afloat in British Youth Sailing’s recognised dinghy and windsurfer classes. Among those taking part were some of the nation’s most promising young racers, as well as a host of kids getting their first taste of sailing. Bethan Owens ands Libby Smart in action. The Regional Junior Championships were previously known as the RYA Zone Championships, but the decision was taken to change the name to truly reflect the nature of the regattas: a fun, inclusive festival of sailing for under 19s regardless of ability, but with a championship element for serious racers. 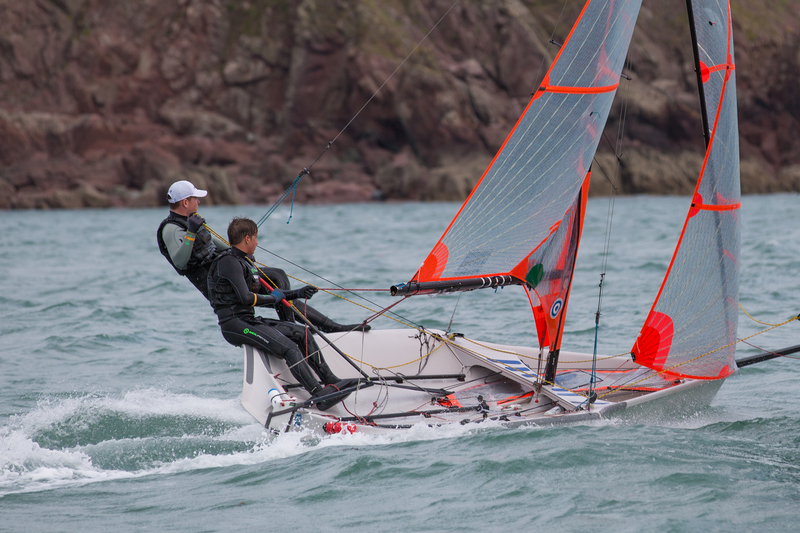 “There was a lot of fun all the way through the levels, but there was also some high quality sailing which was very competitive at the top end,” said RYA Cymru Wales high performance manager Paul Simes. “Congratulations to Tasmyn for coming out top in the Optimists, winning three races outright along with a second place was a tremendously strong performance. “Callum Davidson-Guild knows what it takes to win at these events. He and Oscar had a battle royal with Cardiff Bay pair Jamie Cook and Will Martin, who came second in the 420 but came out on top in the General Handicap. Llyn Brenig’s Green enjoyed a four point advantage over second placed Huw Farmer, from Llangorse, with Cardiff Bay’s Ewan Plowden-Wardlaw in third. Cardiff Bay claimed seven of the top 10 places. Clywedog’s Iwan Roberts was the top Topper, two race wins helping him hold off the challenge of Thomas Willett of Llangorse, with Pressdee in third. Cardiff Bay and Chelmarsh pair Rhys Lewis and Drew Wright were third in the strong General Handicap field, behind the Cook/Martin, Davidson-Guild/Hawthorne pairings. Tata Steel’s Sophie Edwards and Katie Taylor were third in the 420 class and leading girls.